The Loews Philadelphia Hotel, in operation since 1932, is housed inside the nation’s first skyscraper, the historic PSFS building on Market Street. Oozing Mad Men-era décor and classic sophistication in the lobby and restaurants, Loew’s combines history with modernity in its 581 guest rooms and suites. 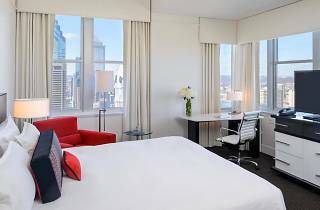 Rooms are stunningly outfitted in an art deco style with high ceilings and beautiful views of Center City. 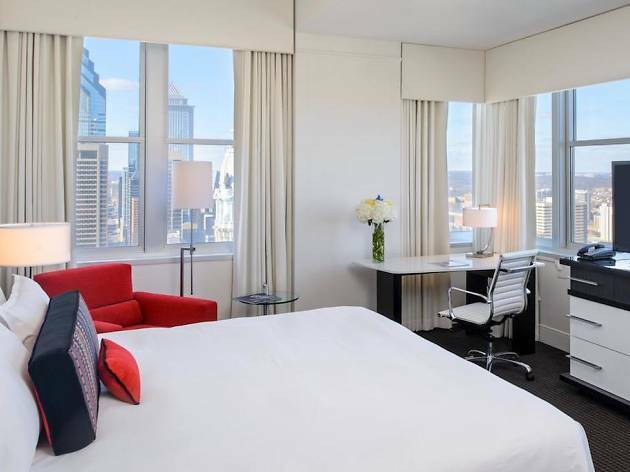 While it offers excellent amenities for business travelers (ergonomic desks and free wi-fi in every room), guests traveling with children are also guaranteed a wide array of special services. Make sure to ask about the complimentary child-proof kits to baby-proof your guest room and take a peek into the “Kids’ Closet,” storing everything from board games to DVD players with kid-appropriate DVDs.